Uganda's telecommunications companies serve more than 19.5 million mobile subscribers out of an estimated population of 36 million, a 52.3 percent penetration rate according to the Uganda Communications Commission (UCC) as of December 2014. Rage et.al (2011) reported that Uganda was ranked among the top ten African countries with the highest number of mobile phone subscribers and that MTN and Airtel Uganda have the biggest share with more than 17 million users split in between them. While Maestas (2013) has it that a huge part of the population has not just one cell-phone but always two and sometimes more. Meanwhile, Freedom house (2014) reported that internet penetration in Uganda had grown steadily following the deregulation and liberalization of the information and communications technology sector in 1997 which ushered in a reduction in mobile telephone tariffs and bandwidth prices. And the new surveys from Pew research center show that 93 per cent of Ugandans with a secondary education or higher own a cell phone compared with 61 per cent of those with a less educational level. Pew says that more people in Uganda have access to cell phones than to electricity. With the dire need to be connected, they go to great lengths to use cell phones including charging them with solar chargers. More than 80 percent across the country use their phones to make telephone calls and to send text messages while 30 per cent use them to make or receive payments, 21 per cent to get political news, 19 per cent to access social networks, 17 per cent to get health information and 14 per cent use them to look for jobs. Cell phones are sold in every corner of the country however; Simba telecom has continued to be an outstanding phone dealer in Uganda. They certainly have smart phones at super prices that you can afford. Additionally, the Chinese have flooded the market with smart phones which are also very pocket friendly to the middle class Ugandans who make up the majority of the population. Apart from MTN Uganda and Airtel Uganda, other available networks include Uganda Telecom, Africell Uganda, Smile Telecom, Sure Telecom, K2 Telecom, Smart Telecom, and Vodafone Uganda. Information and communications technology contributes to about 6.5 per cent of the country’s Gross Domestic Product largely driven by the telecommunications sector according to Mr. Godfrey Mutabazi, the UCC executive director. 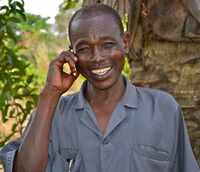 He said that mobile phone accessibility in Uganda has been on a trajectory growth, increasing to 20.7 per cent then to 46.7 per cent in 2008 before growing up to 52.3 per cent in 2014. The above data according to analysts shows that Uganda is on the path to maximum tele-density penetration with an annual growth of about 20 per cent.